The Last Thing You’ll Ever See: Alligator, Mississippi—The little Delta town of Alligator gets its name, as you might expect, from the monstrous 28-foot reptile seen above, which halved the village’s population over a terrifying one-week period in 1907. No, actually, it’s a bit less interesting than that. 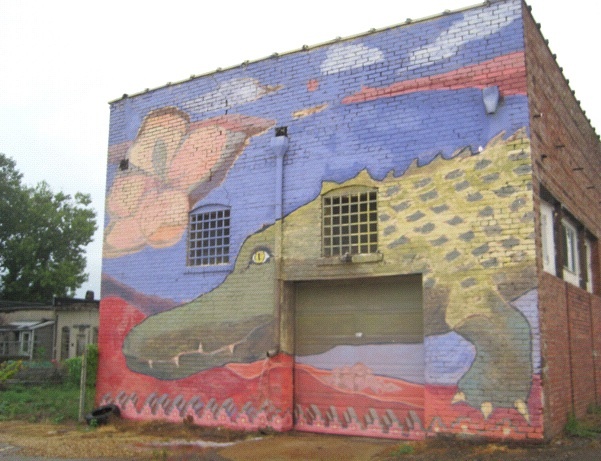 Giant mural notwithstanding, the town’s actually named for a nearby lake, which, in turn, is kind of shaped like an alligator. Voila. In 2008, Alligator elected its first-ever black mayor by 10 votes, 37–27, on a platform of change and a new swimming pool (alligators not included). The full story, via the Telegraph, is actually pretty fascinating.